With over 30 years of experience, Papillon Ribbon & Bow is a worldwide specialist in providing customizable ribbon solution for cosmetic companies across the world, servicing our clients out of our six offices and warehouses around the world. Our design teams work closely with clients to develop the most innovative packaging solution for their products. Here is a snapshot of two of our projects and innovation. 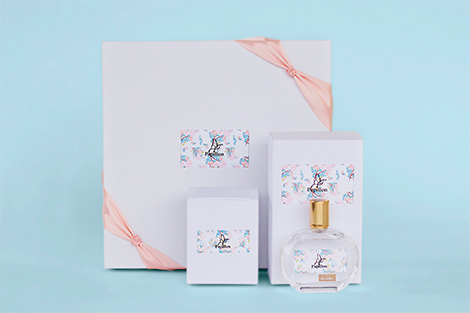 We have developed a unique textile label that is great for perfume bottles, cosmetic containers and boxes. These labels are printed on ribbon and specially kiss-cut, and packed by the roll for easy application. 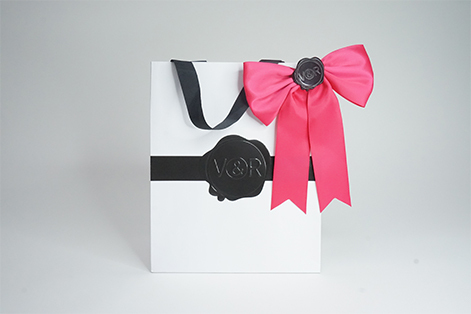 The Viktor & Rolf brand has created an enchanted universe for its Christmas campaign 2017 and Papillon Ribbon & Bow played an active part of that by developing for Viktor & Rolf a voluminous knot satin in 3 corresponding colors to the flagship perfumes of the brand: Flowerbomb, Candy and Spicebomb. With a width of 190mm, this sewing pattern, adorned with the signature, is fashioned by hand from its 100mm wide satin ribbon. Posed on pins, it accessorizes both the gift bags of the brand, as well as the sales staff. Flowerbomb, Candy and Spicebomb. With a width of 190mm, this sewing pattern, adorned with the signature, is fashioned by hand from its 100mm wide satin ribbon. Posed on pins, it accessorizes both the gift bags of the brand, as well as the sales staff.